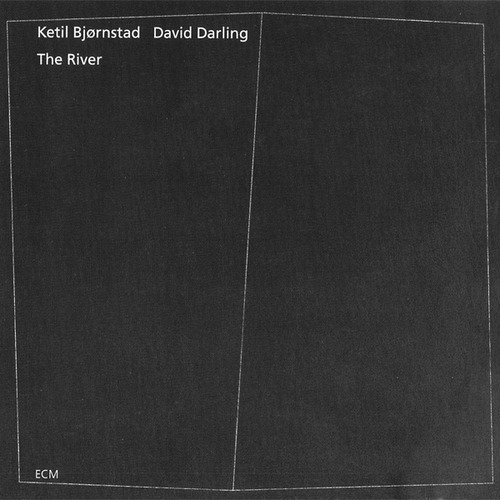 If ever there was a seed beating like a shaded heart in The Sea, it was the twined musical filaments of Ketil Bjørnstad and David Darling. 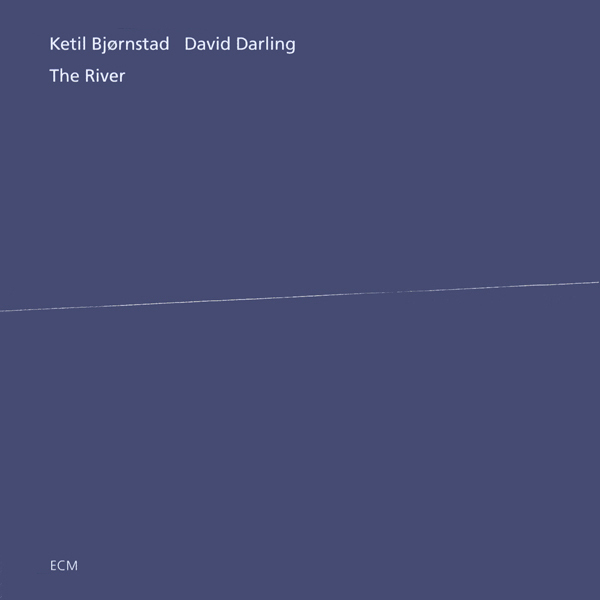 The Norwegian pianist and American cellist spoke on that session like siblings, at points giving us a foretaste of the droning flavors we encounter at the edge of The River. The size and scope of the water have changed in name only, for here is the former’s other half, spreading its finger paint across twelve parallel sections. If we note anything different this time around, it’s that the horizon feels so close that we could just close our eyes and reach out and there would be the sun. Bjørnstad’s love of aquatic themes stretches an ideal surface tension across which Darling may unfurl his sails. The delicate ostinato of one becomes the leviathan drone of the other, drawing threads through opaque expanse (just as Swiss-born artist Mayo Bucher has placed a white edge through this and select other ECM cover paintings). As cello keens and trembles through a pianistic hall of mirrors, it ladles shadow from the wells of solitude in which we all take shape before birth and to which we also return, lowered in buckets of light. So is The River as much about earth as it is about water, impossible to separate from the glitter of mineral deposits that marks its flow. Darling may paint the air as a salmon through the current, but he is also keenly aware of the sediment kicked up by his journey, of the molecular oneness that binds. Lost to the gazes of two figures crouched at the banks, lowering offering memories to an open fan of moonlight, he swims on. These are pieces of subtle virtuosity, timbre, and emotional integrity, utterly devoid of self-interest. Their flowering symmetry is a living palindrome of surrender that shuns the pleasures of its philosophies in favor of feeling for its own sake. Though overwhelming at times, there is never a possibility of drowning when water is your air. In this reverie there can be no reveries, for the world is already a dream. The River and Epigraphs are, along with Stanko’s Lontano/Soul of Things/Suspended Night trio, our standard Sunday morning with coffee, breakfast and newspaper habit. Just gorgeous, deep, timeless music, the work of geniuses. If you can believe it, I have yet to hear the three Stanko albums that I know are such favorites of yours. I’ve been holding out until I get to them on my chronological journey, knowing they will be fabulous. As for The River and Epigraphs: genius indeed! Love that ‘when water is your air’ image. I shall hold onto that one. Good album. Like most reviewers this one is full of meaningless BS that does nothing to help the average music lover really understand what this album is all about. Bunch of shang ra la in la la land. I’m very sorry you feel that way, Dan. My experience has been the opposite. Most reviewers resort to common, everyday language to describe the indescribable. I’m simply trying to differentiate myself by painting the music in its own colors. Anyone can write, “Here’s an album of music for piano and cello. It’s on the ECM label. It has a range of moods and textures. It’s pretty. Buy it.” But what does this say that hasn’t already been said? Also, I don’t believe there is such thing as an “average” music lover. Out of respect for that fact, I don’t believe my language should be “average” either. Both kinds of writing (the everyday and the impressionistic) are equally important. I want to balance most of what’s out there with something more intuitive. Still, I respect what you’re saying. I seek to please as many readers as possible, and am always open to revising my writing when certain readers have problems with it (I did this with my Pircher/Pepl/DeJohnette write-up). I admit to getting carried away with my language at times, and may just attend to this review again to make it accessible to both audiences. Good to have your thoughts about this and other KB albums, as he’s almost entirely below-the-radar here in the US (while a major figure in Europe).